We are glad you are interested in joining MAPSS. There are three different levels of MAPSS membership. 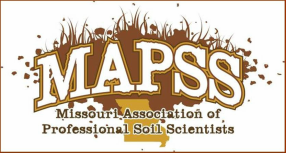 By becoming a MAPSS member, you support our mission of soil education around Missouri. There are great opportunities for you to "give back" and help train our next generation the importance of soil resources. MAPSS Members are also invited to the Annual Business Meeting. This event is scheduled by the Executive Board and usually involves great BBQ. Requirements: Possess a baccalaureate degree with 30 semester hours, or equivalent, in the biological, physical and earth sciences, with sufficient credit in the agronomic sciences to meet current Federal Civil Service Commission standards for a GS-5 Soil Scientist, plus 2 years of experience in the practice of soil science, or possess a baccalaureate degree and have at least 4 years of experience in the practice of soil science. Meet the requirements of Full Membership except experience. Interest in soils but does not qualify with the above credentials.